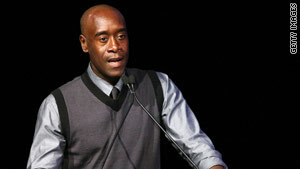 Los Angeles, California (CNN) -- "Hotel Rwanda" star Don Cheadle got a first-hand view of horror when he traveled to the devastated Darfur region of Sudan in 2005. He saw what it's like in an area in which tens of thousands have died and many more have been rendered homeless. He came back inspired to try to help. And this Thursday, he'll return to one of the efforts that has had the most impact. Cheadle, poker champ Annie Duke and their friend Norman Epstein founded Ante Up For Africa in 2006, hoping to raise money and awareness of issues in Sudan and help bring peace to the region. Initially, their goals were as modest as the problem is massive: They pictured a one-off celebrity poker tournament that might raise $20,000 or $30,000. The first day's take for their new charity: $700,000. They were onto something. What do you think of Ante Up's efforts? "Everybody wants to give, but they also want value in return for their time," says Duke, positing that trying to beat a movie star or a pro athlete at cards is a better tool than "boring speeches" at a rubber-chicken dinner. "I think there's a variety of ways to do that that are effective, but I'm not sure anything is more effective than a poker tournament, because people come and they can genuinely hang out with celebrities and some of the famous poker players, and just have a really fantastic time while they're giving." As incongruous as those images may be -- well-fed celebs laughing around a poker table, versus millions of subsistence farmers and nomads being killed or driven from their villages -- there's no arguing with the group's success. Ante Up For Africa has raised about $2.5 million and has spread awareness of the disaster significantly. It's had events at the World Series of Poker in Las Vegas, Nevada, and in Monte Carlo, Monaco. On Thursday, the San Manuel Indian Bingo & Casino in California is hosting its second annual event for the group and has anted up $500,000 of its own to the charity. More comes from the hundreds of participants, and not just those who lose their $150 buy-in. "They give what they want to give," explains Cheadle, who says the big winners routinely kick in some or all of their purses. "We ask at least 10 percent, but some people, most people actually, every year have given back everything." Naturally, the star power is a big attraction. Celebrities can be just as awed as "civilians" by stars in another field, whether it's Matt Damon and Ben Affleck itching to sit down with the best poker players in the world, or athletes like Herschel Walker who care far less about the game than about hanging out and having fun. And then there are those "civilians" -- about 300 members of the general public who can go one-on-one with a star at the poker table. Casey Affleck (one of last year's big winners), George Lopez, Cheryl Hines, Marlon Wayans, Ron Livingston and Mekhi Phifer are among the celebs confirmed for this year's tourney. "Everybody that's just a regular Joe wants to have a story to tell about how they took out Annie Duke, or they took down Howard Lederer, or they took down Don Cheadle or Matt Damon at the table," says Cheadle, whom Duke calls a talented and fiercely competitive player. "I think it's part of the fun in the tournament as well. ... But everybody still ultimately understands what they're there for." Players also learn about and fund groups like Refugees International, the Enough Project and the Darfur Peace and Development Organization, which works to create an infrastructure in the devastated region. The latter is run by Darfuri people, who, as Duke notes, are less likely to be thrown out of the country than foreign aid groups. "One of the things as an organization we are really focused on is long-term solutions to the problem," says Duke, "and one of the ways to do that is to look at the people from within the country being able to help themselves." Yes, there's an apparent disconnect between celebs in the spotlight and those they're trying to aid. "Brad [Pitt] is fond of saying -- and he's right about this -- he can't get out of the light, you know. And these guys can't get in the light," says Cheadle. "Some people look at that and are cynical about it and think, that's just frivolous celebrities trying to give themselves some sort of gravitas. "But I still say, even if it is that, there is still something going on over there, and we want you to look over there. So you try and take the opportunity whenever you can."